CalChamber’s laminated 27.5” x 30” English poster and 27.5” x 29” Spanish poster each combines the multiple pages of Wage Order 16 into one convenient poster. These posters are recyclable. Wage Order 16 regulates wages, hours and working conditions in the On-site Construction, Drilling, Logging and Mining industries. 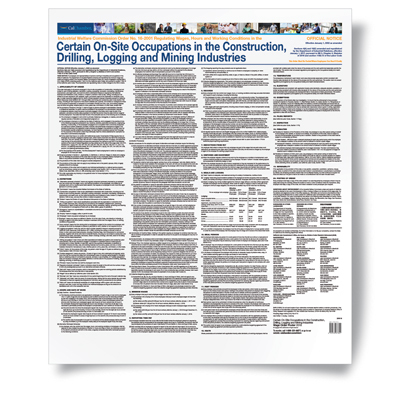 “On-site construction, drilling, logging and mining industries” includes all people employed in the on-site occupations of construction, including work involving alteration, demolition, building, excavating, renovation, remodeling, maintenance, improvement, repair work and work for which a contractor’s license is required by the California Business and Professions Code Division 3, Chapter 9, sections 7025 et seq. ; drilling, including all work required to drill, establish, repair and rework wells for the exploration or extraction of oil, gas or water resources; logging work for which a timber operator’s license is required pursuant to California Public Resources Code sections 4571 through 4586; and mining (not covered by Labor Code section 750 et seq. ), including all work required to mine and/or establish pits, quarries and surface or underground mines for the purposes of exploration or extraction of nonmetallic minerals and ores, coal and building materials such as stone and gravel, whether paid on a time, piece-rate, commission or other basis.